I’m bummed that I made that big mistake over there, couldn’t jump the triple. But we were off all day, really far. To come out in the qualifier and be where we were and also in the main event with the track really deteriorating, I’m happy. I couldn’t really ask for any more because we were way off in practice. What happened when you made the mistake? There was just a little rut before the triple and my rear tire just missed it. It wasn’t a real rut, it was just a minor little edge that we were catching and my rear tire missed it. You knew that he was catching you? I actually thought it was [Ryan] Dungey that was there. 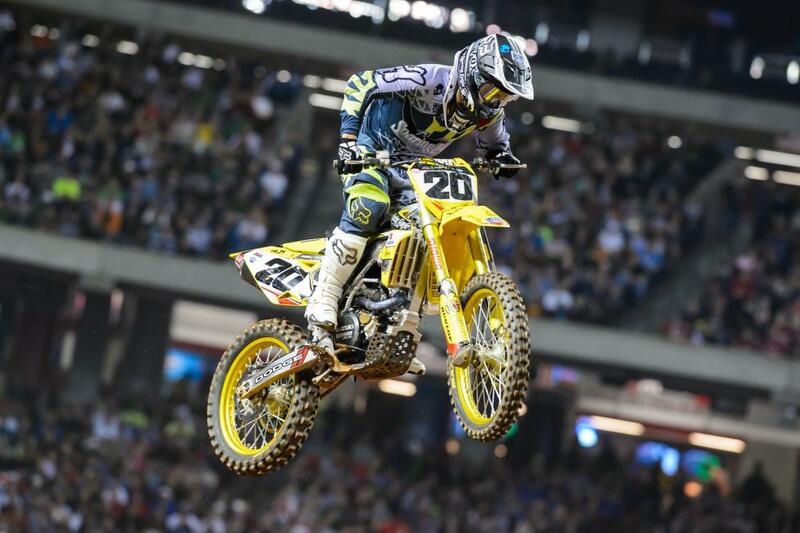 I didn’t know Kenny [Roczen] was there. KTM’s a little quiet. You mentioned being off in practice. What were you working on today? Nothing, we were obviously trying things, kind of shuffling settings and stuff but ultimately we went back to what we were running—just a minor change, pretty close to what we showed up with today. Today I just felt pretty good everywhere, just struggled in the whoops really bad. Couldn’t figure out what it was. We tried not to stray too far from what we had and just come back out in the heat. That one set of whoops looked like they were really spaced out. They were super close to the turn. They were really big. And then the turn before the long set was really super soft and rutty and the whoops were kind of dry and separate so it was kind of a bad combination. Everybody used to look at this place as being really sticky. Last couple years it’s been kind of slippery. It hasn’t been typical Atlanta. Compared to practice, where you were struggling, not even top five in lap times, do you feel you just rode better in the night show or did things just come together? You didn’t really change the bike much, you said. Just minor [bike changes]. Obviously in practice the track was really hammered and I just struggled with it like that. It was really hammered in the main event also, but basically just rode better. In practice I felt like I was pushing and trying and doing everything that I could but nothing was coming up on the board. 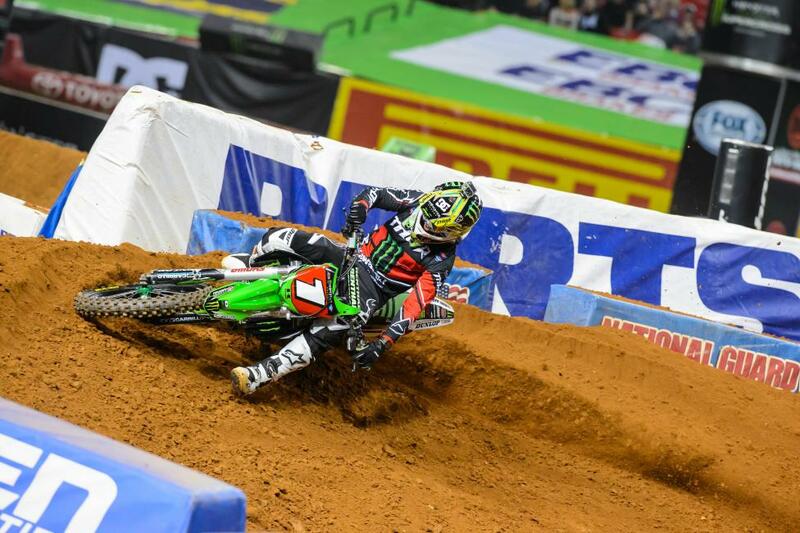 How bad was the track at the end of the main? It looked tough. There were certain areas that were really gnarly. Coming into the short set of whoops there was a huge hole coming in. There were a lot of big rocks and stuff out there. Some spots are really spongy after the triple and then the turn after the short set of whoops was like powder. A lot of different terrain. So does Kenny get kicked out now? If anybody wins, I’d like to see Kenny win. Maybe next week? People are waiting for you two to fight! That start from the LCQ gate pick, nice job on that. First of all, the heat race, I felt really good the first lap, just was in the flow. Then I screwed up in the whoops, foot came off, right in the bales. It was RC’s [Ricky Carmichael’s] Houston heat race ’01 to the T. Watch it, same thing. Then I bent my front brake rotor, went down again in the whoops. So it looked like I had no idea what I was doing! I pooped my pants on the line in the LCQ; I was that scared that I wasn’t going to make it in. I was like, “Please don’t come from winning the race to not making the main!” That would have not been good. First let’s talk about the ride. It was good. You were fast. I felt awesome today. First lap on the track I kind of got comfortable and jumped everything right away. The non-timed practice I was third on the board. I just had a good attitude all day. I had a really good week last week and I think that’s what it was. The team and I went out a couple days and got some stuff done. I felt like I did the best two days of practice I’ve done all year and in a long time. So it was really good to start out well here and I qualified third in practice. I felt like in the heat race I could have been right there with James if I would have been there. I felt like I was really strong in the whoops. I felt almost effortless. I felt like everything was coming to me. I know that’s the way it’s supposed to feel every time, but I felt really good out there. For sure. I feel like I’m just starting to build the momentum now. I’m not worried about anybody else anymore. I’m kind of worried about myself and I think that’s what helping me. The team’s done a great job with everything, getting us out when we need to try stuff and working on our starts. I think it showed today. My starts were pretty good all night. All three starts were decent, better than what they have been. We’re all working good as a team. After practice and everything we were making adjustments in the right direction because we know where we want the comfort and we know this and we know that. I feel like we’re in a good spot to keep building. Talk about the whoops. You were killing them. By the end of the main event it seemed like there was nothing left, but when they were big you were crushing them. I was just committed. I’d rather just rail the berm and whatever happened, happened, but every single time it was good. I only got squirrelly a couple times, but I was trusting my bike. Was that part of it, is it setup? For sure. As soon as I hit them a couple times I just felt some confidence in myself. Once I felt that I just said I didn’t care anymore and I just kept doing it, and it was easy. I honestly wasn’t even on the gas that much. I just carried that much speed into them. I felt like it helped me get up on top. I was pumped with tonight. It wasn’t the best result. I got seventh again like I did last week. I feel like I deserve to be better than that. No doubt next weekend we’ll have a better weekend and have another good week this week so we can get away from that cheese pizza [nickname]…. [Laughs] There was definitely some pepperoni on that pizza tonight. You had some spice! So, hey, anything else happen of note tonight? You were in fourth in your heat race and then, um, something happened. I made a pass on [Mike] Alessi. Actually I started the heat race out really well. I was in third and ran into Wil [Hahn] a little bit and stalled my bike. Got back up, I was probably back in eighth or ninth and just made my way through the pack. I think the whoops were saving me. I just passed him in the first set of whoops, squared him up, ran down the straightway and before you know it I’m exciting corner and somebody’s T-boning me exiting the corner and I go flying and whatnot. So it is what it is. We’re going to erase it out of our book and I’m going to next weekend. Has he [Alessi] said anything to you? You talked to me last week and you were like, “Hey, I can get up on the box.” Wharton was faster than you in practice. You were a little bit off the start, but you persevered and got a third. First of all, gnarly track. It took a lot out of you. It was one of the better tracks I think in terms of being pretty technical and the dirt and all that. Unfortunately I think it was difficult to pass, so I don’t know how great that was for the fans and even the riders. The start was really important. I like how the track crisscrossed a lot, but overall it came down to the start. Your race, 10th place, kind of a lonely 10th? You seemed a little faster than last week. At one point in the main event, first lap, second lap, you were way back. What happened? Bad start. 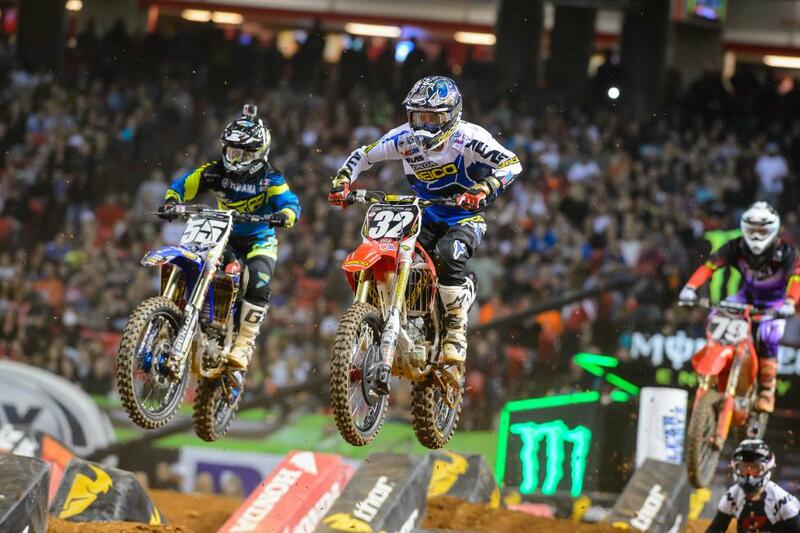 Me and [Blake] Baggett came together off the start. He was back with me. He was able to get to the front and I just wasn’t able to. I didn’t make enough passes early on and once people spread out it makes it a little hard. But all in all my bike was great, my team was great, just needed to be more aggressive and got to go back this week and work harder. Something I wanted to ask you about, your first practice, first timed one went very good, on the board, riding well. Second one not so much. What happened in the third practice to knock you back in overall qualifying?